With the past 24 hrs being utterly crazy in the BB house, there's no telling what today will bring! As of right now, Kaitlin is still slated to go home tomorrow night. Helen is telling Andy about her talk with Elissa last night. She said she told Elissa that the fight ended up making Aaryn look good & making Elissa look like the bad guy. Also, that when you're in an alliance, you protect them, not throw them under the bus. She also told Elissa that she can't keep doing stuff like that because their alliance won't wanna work with her if she keeps it up...so either play by herself or play with the people that are in her alliance. They talk about if they should stick to their plan of telling Kaitlin tomorrow that she's going home or not. They start talking about alliances. Judd mentions that he has 3 but he's only loyal to theirs. Helen tells them that per her convo last night with Elissa, that she (E) is gonna vote Kaitlin out. Judd mentions that he no longer can trust Elissa. Andy agreed. Helen tells them that they have to make sure that Howard/Spencer/Candice/Elissa don't win HOH tomorrow. Helen mentions that Elissa would have no problem putting Howard up if she won HOH. Helen's concern is that Howard/Spencer will try to backdoor Amanda if they win, so they (as an alliance) need to protect Amanda. Helen thinks America picked Howard to be MVP this week. Judd starts talking about Kaitlin and how she wants to know if she's going home or not, but he can't tell her yet because he's afraid it'll put a big target on himself & she'll have time to do last minute scrambling for votes. *Andy/Judd/Aaryn/Jessie are talking non-game at the moment on the BY couch. Aaryn: "Everytime Spencer talks about your breasts & he wants to see you (Jessie) naked, it makes me wanna vomit." Jessie: "Ewww!! He said that????" Aaryn: "He said you look like you taste like butterscotch." Jessie: "That makes me really grossed out!!" Judd: "He's said that like 4 times." Jessie: "That's really gross. I'm gonna pretend you didn't say that." Aaryn: "And when he was massaging your shoulders.."
Jessie: "That is never gonna happen again!" Aaryn: "I think we should call you "Butterscotch". Talk is about lack of sleep last night & morning songs that BB woke up the HG's with today. One of the songs was "Brass Monkey" by the Beastie Boys. *Amanda is seen awake on Cam 3 now. *Andy is gonna make slop for Jessie & himself. Amanda tells Andy/Jessie that she heard McCrae's tummy growl this morning and it sounded like her dog whimpering to jump up on the bed & now she really misses her dog. Talk is about the fight last night. Judd said he's not gonna tell Elissa anything that he wouldn't tell everyone else. (He doesn't trust Ellissa anymore.) 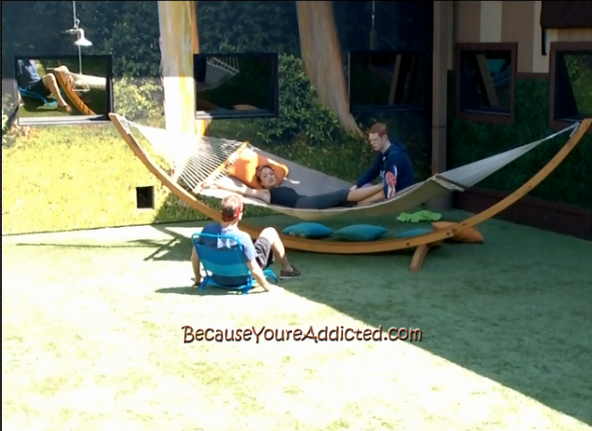 They agree that there's a target on Elissa now because she made herself look bad last night. They think that Ellissa has been "babied" her whole life & feels "entitled". Aaryn mentions how Elissa will want people to apologize to her for stuff that she's done wrong. Judd said she never apologizes for stuff she does. Jessie tells her about Spencer saying that Jessie looks like she "tastes like butterscotch". Amanda: "Oh my god, I hate him soooo much. I never hated someone as much as I hate him." Aaryn said that now Kaitlin/Gm are friends and she (Aaryn) was pushed out from their 3 girl group. Judd: "That's how groups of 3 women work, I always noticed that." Judd: "Pull up your pants, I can't take you seriously until you pull your pants up." Amanda tells McCrae about how his tummy growl this morning sounded like her dog. **I'll be starting the Afternoon post in a little bit! Until then, enjoy the live feeds!! I really hope Helen's threat to Elissa just makes Elissa go rouge even more, or at the very least give Howard a break. I think it is really funny how everyone is getting mad at Howard and Spencer for playing the game and trying to keep themselves safe. So they are just supposed to sit around and let the rest of the house tell them what to do and wait to get picked off. Also, Helen, Andy, and Jessie are such a hypocrites. They are getting mad at H/S and Candice for doing the exact same thing they (H/A/J) are doing. One thing I hope happens out of this is that Howard ends up playing the game without Spencer. I think that Howard's game would be so much better without Spencer. There are a few things that Howard is being linked to because of Spencer. If Howard (or any of the other guys) goes, this year will be nothing but a bunch of catty women fighting each other. It will be like a season of Real Housewives, but with competitions added to the show. I was grossed out by Spencer just by the couple of things I know he said. But wow, he is truly perverted. I can't believe he says things like that knowing that his girlfriend will see. And if he thinks that she won't watch the live feeds (even if she promised him she wouldn't do so), then he is dumb, dumb, dumb. He probably doesn't know that she is most likely NOT his girlfriend anymore. Another delusional hg...the house is loaded with them. Has anyone seen Nick's reaction to GM's madness? Please let me know if you have. That'd be so entertaining to see. Jamie, I love your blog ! BB is an interesting game which seems to bring out people's personas. I would be crazy in less than a day ! I have been quietly lurking here for a few years now. thanks, Jamie, for making BB Fun ! Who made Amanda The Big Brother Landlord? She is so annoying!!!!! Telling people who to put up and who to vote out and who can talk to who. She is a bully. When she wins something then maybe I will have a new found respect for her. She is gonna mess up McCraes game. WHY DONT SHE SHUT UP!!!!!!!!!!!! I hope she is on the block next week. I think it will help McCrae for awhile. She is making her self the target but getting him farther in the game. I was looking forward to watching McCrae play the game but for now he is being overshadowed by Amanda. Strategy or love. I can see her going in a few weeks and i hope McCrae gets in the game and does not get all personal when Amanda gets booted out. I agree with AmandaHater. Who died and made her BOSS? She is good for McCrae's ego and that is it! I would love to see him play without her! !